AWD, Cocoa/Cashmere Leather. White Diamond Clearcoat AWD 2007 Cadillac Escalade Base Vortec 6.2L V8 SFI Priced below KBB Fair Purchase Price! Proudly serving Kentuckiana for over 40 years with an A+ BBB Rating! Having 7 convenient locations and over 800 vehicles, we're sure to have the right car at the right price! Inquire to schedule your VIP test drive today. All prices plus tax, title, lic, and dealer processing fee. 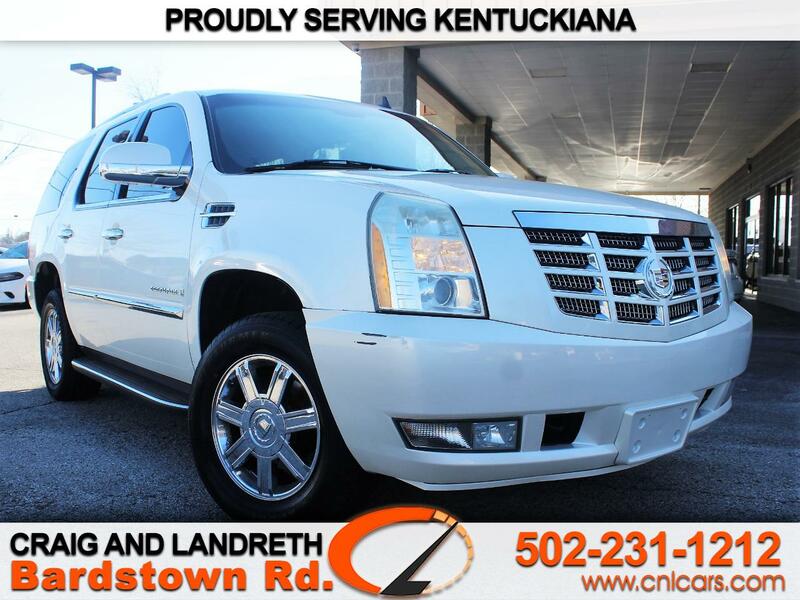 Craig and Landreth Cars * Fern Creek * 6203 Bardstown Rd Louisville, KY 40291 * Call 502-231-1212 * Trade-ins Welcome - Financing Available * CALL 502-231-1212 * 7 LOCATIONS * A PLUS BETTER BUSINESS BUREAU RATING * IN BUSINESS SINCE 1975 * GET PRE-APPROVED 24 HOURS A DAY! DISCLAIMER: The advertised price does not include sales tax, vehicle registration fees, finance charges, documentation charges, and any other fees required by law. We attempt to update this inventory on a regular basis. However, there can be lag time between the sale of a vehicle and the update of the inventory. EPA mileage estimates are calculated for newly manufactured vehicles only. Your actual mileage will vary depending on how you drive and vehicle maintenance. Before purchasing this vehicle, it is your responsibility to address any and all differences between information on this website and the actual vehicle specifications and/or any warranties offered prior to the sale of this vehicle. Vehicle data on this website is compiled from publicly available sources believed by the publisher to be reliable. Vehicle data is subject to change without notice. The publisher assumes no responsibility for errors and/or omissions in this data the compilation of this data and makes no representations express or implied to any actual or prospective purchaser of the vehicle as to the condition of the vehicle, vehicle specifications, ownership, vehicle history, equipment/accessories, price or warranties.